One big ideaaand thousands of small decisionssare behind any architectural project. For the Museum of Modern Art, reopening this week, Kohn Pedersen Fox was responsible for translating Yoshio Taniguchi’s minimalist concept into a buildable construction. Here’s a sampling of technical solutions that are integral to the museum’s new image and experience. The new MoMA orients visitors’ views of the garden courtyard along its length. The interior is a volumetric puzzle of rectilinear compositions, floating planes, and interlocking spaces. When Yoshio Taniguchi won the commission to expand and renovate the Museum of Modern Art, he had every intention of moving his operation from Tokyo to New York for the duration of the project. Aware of the difficulty of navigating the straits of New York City construction, the museum proposed he partner with a firm with experience building locally. His response? If you insist on a collaboration, I want to work with a design firm, not just a firm that stamps drawings,, paraphrased architect Stephen Rustow of Kohn Pedersen Fox (KPF), which the MoMA ultimately hired as executive architect of the $425 million project. The architect-of-record arrangement was also a new experience for KPF. But the prestige of the project was hard to resist,, said Rustow who, with Tom Holzman, led the project. Also, it gave us a chance to engage seriously with a cultural institution.. The firm had wanted to break from its stereotype as a tall building specialist. 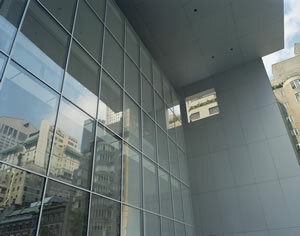 Rustow, who had worked at I. M. Pei’s office and supervised the construction of the Louvre expansion, was hired by KPF expressly to manage the MoMA job. For five years, an architect from Taniguchi’s atelier worked in KPF’s New York office while eight of KPF’s employees relocated to Japan. The collaboration proved to be a necessity because of the continual shifts and refinements of the building’s programming, which required the design to undergo constant fine-tuning. There were strong preliminary notions about where the primary collections would be located, but things were changing up until two months ago,, said Rustow. (KPF was also called upon to oversee the renovation of the original 1939 building by Phillip Goodwin and Edward Durrel Stone and the Philip Johnson addition of 1964. The job entailed the complete replacement of the 53rd Street facade and the renovation of several interior spaces.) The more important issue, however, was how to translate Taniguchi’s design intent within American engineering and construction standards. While plenty of articles will no doubt assess the architects’ overall accomplishment, we felt the nitty-gritty problem-solving was worth highlighting, too. With the walls in the museum’s atrium space four stories high at certain points, the question of its surface material became a major issue. At one point, Taniguchi considered metal panels, but this raised the problem of a pattern across its surface that would be distracting as a backdrop for freestanding or hanging art. Plaster made obvious sense because, in theory, it is limitless. However, industry standards in the U.S. require an expansion joint every 30 feet to prevent cracking. The resulting grid would be just as bad, not to mention contrary to Taniguchi’s general minimalist aesthetic. So KPF used curtain wall construction to make the wall structurally independent of the intermediate floor slabs, and tied only to the existing columns, which are 26 feet apart on center. 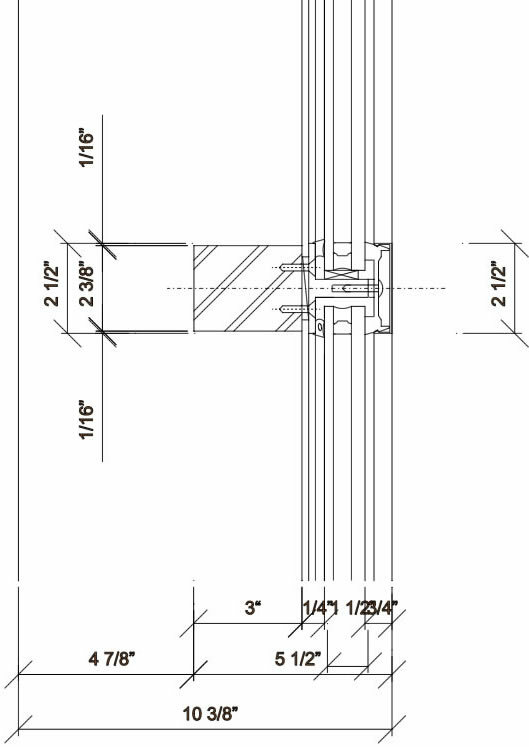 While the way the curtain wall ties into the existing structure varies slightly from point to point as specific conditions require, here’s the basic pattern: The wall is comprised of 14-gauge steel with lateral cross-bracing. Six-by-six-inch steel angles tie the frame to the museum’s concrete slabs for lateral support. (One benefit of 14-gauge steel studs is they can be put up by plaster workers; heavier gauge studs require steel workers, which would have complicated an already tight schedule.) Over this steel framework is a layer of 3/44 plywood, which acts as a membrane and makes it easier to hang art since screws have something to bite into. One or two layers of sheetrock (depending on fire-rating) is attached to the plywood, then finished with a plaster skim coat. To improve the efficiency of distributing electricity and water within the buildinggthe first five floors of galleries and seven floors of offices aboveethe designers had already decided to split the mechanical system. Half of the system was put in the basement, servicing the lower floors of the building, while the other half is on the eighth floor, servicing the floors immediately above and below it. 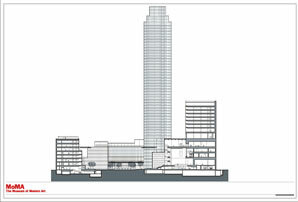 The tower had to be rigidified to support the upper-floor mechanical system. While walking through the construction site one day, consultant structural engineer Guy Nordenson remarked to Rustow, With all the steel in the trusses on the eighth floor, we could probably suspend all the floors below it.. At this point, the steel columns on the 2nd floor were already in place. When the architects brought the idea to museum director Glenn Lowry, he asked, Are you serious? What would it entail?? Just a little bit more steel on the eighth floor for added strength. Once in place, the construction crew torched away the steel columns they had put there months before, clearing the way, to the curators’ delight, for an impressively expansive, uninterrupted gallery. All of the new gallery walls have a 1-inch reveal where the wall meets the floor, but on close inspection, the line is a particularly sharp one. Rather than use the typical J-bead along the bottom of the gypsum board, KPF designed a custom Z-profile channel made out of extruded aluminum. The Z-channel is a good example of a solution born from the conflict between Japanese and American construction materials and standards. It is fairly common in Japan for contractors to create a reveal by cutting the edge of a piece of wallboard (different from our drywall) at 90 degrees, then edging it with a thin metal sheet. Taniguchi wanted to refine the standard reveal by slicing the edge at 45 degrees, creating a sharp point. To accomplish this, KPF designed an extruded aluminum channel that could hold two layers of 3/44 materiallhere, wallboard and plywood. Resembling the letter Z, the channel has a tiny round hole inside its point. The hole accepts a small alignment pin to ensure that each piece of channel is correctly in place. After calculating that they would need a staggering amount of channellseveral milessit began to seem pretty reasonable to specify a custom piece and absorb the cost of making the die. Pittcon Architectural Metals, the company that manufactured the channel, was so pleased with the results that it is now carrying the item as a product in its catalogue. Ceilings received a similar reveal treatmenttand solution. To float the ceilings, another extrusion was made, allowing ceilings to float away from walls. The floor and ceiling reveals are more than just aesthetic, however. They are an integral part of the museum’s ventilation system. The internal gallery walls are a bit thicker than normal, and that is because they have a plenum inside. 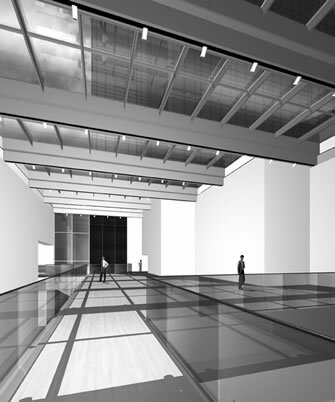 Air is drawn up into the system through the reveal at the base of the floor, conditioned, and ultimately released through a series of thin slits at the ceiling. While leading a group of journalists through a hard-hat tour of the MoMA a year ago, chief curator of the Department of Architecture and Design Terence Riley was keen to point out the little details that made such big difference in the realization of the project. 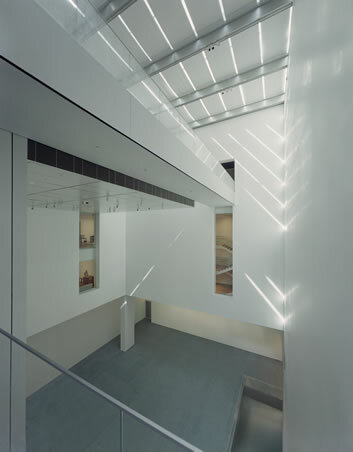 One example was the way the HVAC ducts and other systems were threaded through holes cut through horizontal eyebeams in the glazed west wing that reorients the museum’s entrance toward the sculpture garden. It was a way to keep the floor slabs thin,, Riley explained, appreciative of how the gesture improves the view of the building from the garden. It was also a practical way to align the floors of the new building with those of the old. Ceiling heights were lower in old buildings,, said Rustow. Keeping the floor plates thin in the addition allowed us to maximize the ceiling heights.. The tip of the canopy is tapered, continuing efforts to keep the elevation’s appearance minimal. The third floor slab stops just short of the edge of the building, with a thin steel rod that reaches out to offer added stability to the curtain wall. 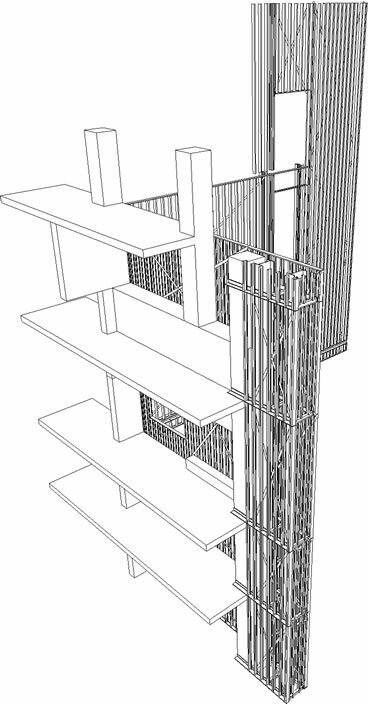 As for the curtain wall, KPF continued Taniguchi’s overriding formal aestheticcminimum joints, minimum support, maximum spans of materials and distancesswith a structure of extremely thin mullions (see detail, above right) made of milled steel. The result is a slender and stiff steel lattice that is both structure and support for the glazing, which architects were able to specify as large as they could get it (14 feet tall, 7 feet wide). The depth of the horizontal mullions was determined in order to give added strength to the wall, enabling it to bear maximum wind load. Architect: Taniguchi AssociatessYoshio Taniguchi, principal; Brian Aamoth, project architect; Peter Hahn, project manager; Keiji Ogawa, Taichi Tomuro, Junko Imamura, team. Executive architect: Kohn Pedersen Fox & AssociatessGregory Clement, managing principal; Thomas Holzmann, senior associate principal, project direction; Stephen Rustow, senior associate principal, project direction; George Hauner, associate principal, job captain; Brian Girard, associate principal, public spaces; Greg Weithman, associate principal, galleries, garden; Robert Hartwig, senior associate principal, office interiors; Claudia Cusumano, Betty Fisher, Erin Flynn, Stephen Frankel, Ethan Kushner, Scott Loikits, Hui-Min Low, Daniel Treinen, team. Associate architects: Cooper, Robertson and Partners, programming; Alspector Anderson Architects, conservation laboratories. Engineers: Sevrud Associates, structure; Guy Nordenson and Associates, structure; Altieri Sebor Wieber, mechanical. Consultants: Zion Breen and Richardson and Associates, landscape; George Sexton Associates, lighting; R. H. Heintges Architects, facades.